Jharkhand 12th Commerce Result 2019 will be declared soon on the official website jac.nic.in, as per the latest reports coming from JAC. Nearly 50,000 students have been waiting with bated heart for the JAC Intermediate Commerce Result 2019 since 9th March – the day when the last paper of JAC Intermediate Exam was held. If sources are to be believed, their patience is about to pay well soon, as the Jharkhand Academic Council has begun the preliminary preparations for the declaration of JAC Result for 12th standard students of commerce stream. Although rumours mills have been churning out speculative dates since long, the unofficial chatter from the JAC officials suggest that the JAC 12th Commerce Result 2019 will be announced soon. Although the official JAC Result date is yet to be notified, sources have suggested that the JAC 12th Commerce Result will come out in the third week of May 2019. After the formal declaration of JAC Intermediate Commerce Result 2019, students will be able to check them directly on this page. Until then, our team would provide tailored news and updates about the upcoming JAC Intermediate Commerce Result 2019 here. To stay updated with every little detail and update, students can register their mobile number and email id on this page and start receiving email alerts about the JAC Result 2019. For more information about JAC 12th Commerce declaration date, checking procedure and other similar factors, please read further. Waiting for the JAC 12th Commerce Result 2019 is equally stressful and nerve-racking as appearing for the JAC Intermediate Board Exam. 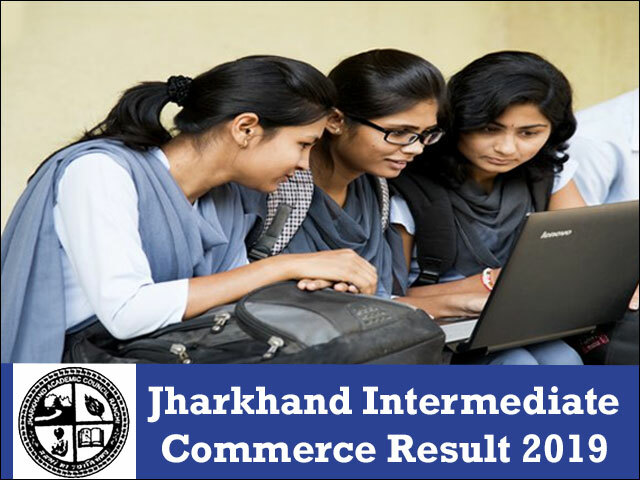 The Jharkhand Intermediate Commerce Result 2019is awaited by around 50 thousand students, and the anxiety is to know JAC 12th Commerce Result 2019 date is making them restless. The Jharkhand Academic Council usually takes around 40-45 days to evaluate and process the JAC 12th Commerce Result 2019. In order to quicken the evaluation process and processing of JAC Result data, the Board also enlists the help of contractual qualified employees. Going by the general trend and previous year records the JAC 12th Commerce Result can be expected around the last week of May 2019. Students should note these are just the speculative date, and should wait for the official announcement of JAC 12th Commerce Result date. You can register for your email alerts service to receive the latest news and updates related to JAC 12th Commerce Result 2019 by submitting your mobile number and email id on this page. Students usually are aware of their performance in the examination and can speculate their JAC 12th Commerce Result outcome by comparing their answers with suggestive answer sheets that are made available by various organisations after the exam. Still, the exact scores and expectations keep them on their toes, and they are eager to know how they have fared in the JAC 12th Commerce Result 2019. Until the JAC 12th Commerce Result 2019 have been declared, they can check out the previous year statics to calm their nerves. The previous year statistics will enable them to analyse the toughness of Intermediate Commerce Exam and will provide them with the insight into their expected JAC 12th Commerce Result 2019 scores. This year, the Jharkhand Academic Council has taken several steps to ensure to improve the quality of higher education for the commerce stream students. Taking this into account the overall pass percentage for last year, it would be interesting to see if students this year manage to improve that number in the upcoming JAC Inter Commerce Result 2019. After the formal declaration of JAC 12th Commerce Result 2019, the same will be made available on this page. In addition to this website, the JAC Result would also be accessible from the official website the council i.e. jac.nic.in. Students can view their JAC 12th Commerce Result 2019, by following few clear-cut steps and providing their essential details as required. Students need to follow the instructions mentioned below to view and download their JAC 12th Commerce Result 2019. Students should be able to view their respective JAC 12th Commerce Result 2019 score if they have provided the valid roll numbers in the allocated space and have followed instructions mentioned above as directed. Along with allowing students to check their JAC Intermediate Result online, students will also have the option to either download a softcopy PDF for the JAC 12th Commerce Result or take a printout of the scorecard for reference purposes. The JAC 12th Commerce Result 2019 have been provided online as part of the digitalisation efforts, however, they cannot be treated as original and the original mark sheets will be delivered to the students through their respective institutions. In order to seek admission to any college or university for further academic pursuits, students will have to provide their original mark sheets for JAC 12th Commerce Result 2019 which are provided by the JAC. Many students might be confused about the career options that are available to them in line with their JAC Intermediate Commerce Result 2019 score. If you are one of them, you can get in touch with our professional career counsellors and Jagranjosh experts who will help you identify the right career option for you. Students can opt of re-evaluation or rechecking also, in case they are not satisfied with JAC 12th Commerce Result 2019. The JAC will recheck and re-evaluate their examination papers under this option. The detailed procedure and application for re-evaluation will be announced by the Board after the declaration of JAC Intermediate Commerce Result 2019. Students will have to pay a nominal fee to get their answer copies rechecked. For those students who have not fared well in the JAC 12th Commerce Result 2019, Jharkhand Academic Council will conduct the Improvement / Supplementary Exam. Soon after the declaration of JAC 12th Commerce Result 2019, the council will issue a detailed notification regarding the compartmental exam for the students who have failed in one or more subjects. The Compartmental Exam for those students who have not cleared the JAC Intermediate Commerce Result 2019 will be held, most likely, in the month of June / July. Students are advised to visit the official board website or contact their respective school administrators to get more information about the Improvement exam. With the formation of separate state of Jharkhand in 2003, Jharkhand Academic Council was also established as a new school board to manage intermeidate school-level education in the state. Jharkhand Academic Council (JAC) was established after dissolution of the Bihar Intermediate Education Council Act, 1992, the Bihar School Examination Board Act, 1952 (adapted as Jharkhand Secondary Examination Board Act, 2000) Bihar Sanskrit Education Board Act, 1981 And Bihar Board of Madrasa Education Board Acts, 1981. Jharkhand Academic Council has brought all the branches of education, be it Secondary, Intermediate Sanskrit (Madhyama) and Madarsa under JAC supervision, for the unification of education policies in the state. The Jharkhand Academic Council follows the curriculum prescribed by the CBSE, and JAC conducts regular orientation sessions for the teachers to weed out any problems while teaching.